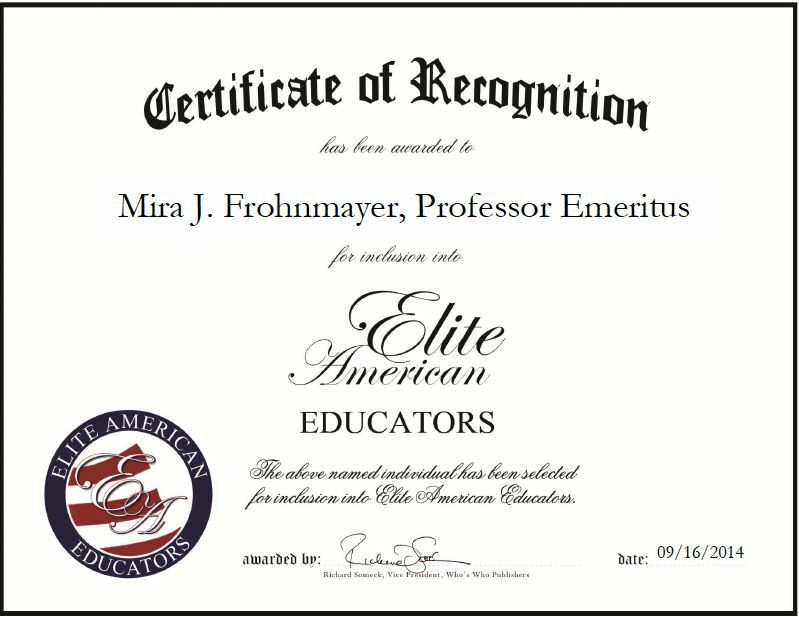 Tacoma, WA, September 16, 2014, Mira J. Frohnmayer, Professor Emeritus of Music and Chair of Vocal Studies at Pacific Lutheran University, has been recognized by Elite American Educators, for dedication, achievements and leadership in music education. Ms. Frohnmayer is now retired from her position as a professor with Pacific Lutheran University. While in that role, she taught French diction, voice classes and the history of music theater. She also supervised 200 students and assisted 12 adjunct faculty members. Ms. Frohnmayer is a professional singer and has worked as a professor in New England, the northwest U.S., Germany and France. She has served as a judge for Metropolitan Opera district competitions, among others, and as a master clinician at several universities in the U.S. She is also on the board of the Eugene Symphony, and the School of Music and Dance at the University of Oregon. Ms. Frohnmayer a musical family. Her mother was an excellent musician, always encouraging her children to nurture their innate musical talents. As a result, she grew up studying music, and after working with gifted mentors, she followed her heart and chose to pursue a career in music. 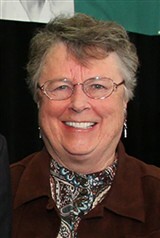 Ms. Frohnmayer dedicated 47 years to the academic field where she garnered a reputation as a well-rounded teacher who was always willing to go the extra mile for her students. She enjoyed seeing many of her students go on to become professional singers and teachers. An award-winning professional, Ms. Frohnmayer attributes her success, first and foremost, to her mother, who inspired her to explore her musical gift. She is also thankful for all the great mentors and teachers she had along the way, and to her personal desire to make a difference in people’s lives. Ms. Frohnmayer continues to share her knowledge and passion for music through giving private lessons. Ms. Frohnmayer earned a Bachelor of Arts in music from the University of Oregon, an MM in vocal performance from the New England Conservatory of Music, and theater credits toward a master’s degree in theater from Schiller College in Berlin, Germany. This entry was posted in Higher Education and tagged music, music theater, opera, professor, singer, voice classes. Bookmark the permalink.